Configure your purchase orders in D-Tools Cloud before you send out. See a step by step guide on how to set up this purchase order. Reference the numbers in the screenshot to the descriptions below. Here is the items in your want to order, for this purchase order. If you need to, you can edit the cost of the product here. We hope you will sync up your suppliers to the D-Tools maintained pricing, but we realize that there will be exceptions and products that we don't have. Enter in your shipping address, shipping method, attention for the shipment, and note for the supplier. The shipping address will be your Company Address by default, but you can change this to the project address, or to another address by clicking change. Shipping method will come what you have configured as the shipping method for that supplier. By default, there is two shipping methods: Standard and Expedited, but you can also create your own. How will you pay? Enter in your billing information into the billing section. This includes billing address, billing method, and dealer contact. The billing address will also default to the address you entered in as your Company Address. You can change this as well. The billing method is how you want to pay for it. By default, you will have 3 different payment options: Credit Card, Cash, Check on Delivery (COD). Of course you can enter your own, like a specific credit card, rewards, or more. Dealer contact will default to you, but you can change it to someone else in your company if you like. Supplier info contains the supplier contact and your account number with that supplier. Both the contact and the account number will be automatically applied if you entered it in the supplier details in the settings. After you have entered all the information for the purchase order, verified the items, check the total for that purchase order, and add shipping and tax if needed. Once everything looks good in your purchase order, and you have checked all the purchase orders, you can export to PDFs. This will allow you to email to the supplier, bring with you, or just keep on record for accounting purposes. After the purchase order has been sent, you can mark the purchase order as ordered, or mark as received once you have received the products within the PO. 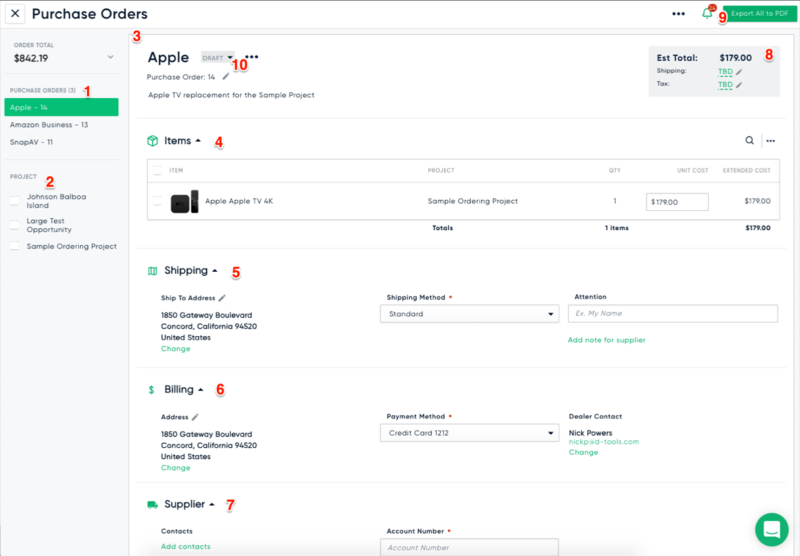 Learn more about updating status and managing purchase orders.